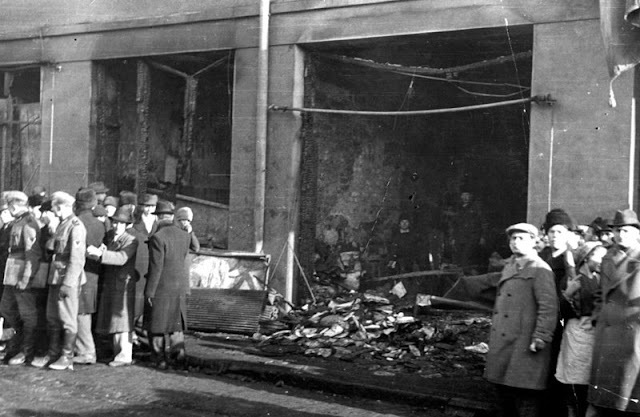 Jewish stores in Bucharest, Romania during the Iron Guard pogrom that ends on 23 January 1941. Italian/Greek Campaign: The battles around the Klisura Pass continue on 23 January 1941. Greek II Corps counterattacks against small Italian successes and recaptures the heights west of the pass. 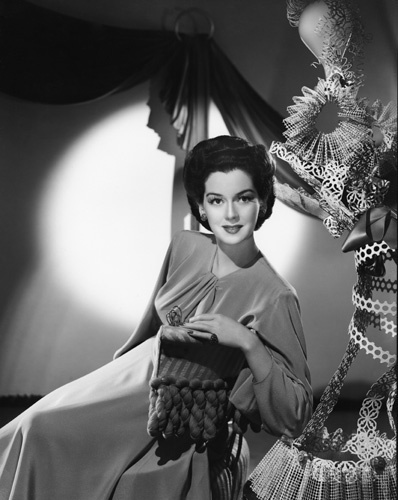 East African Campaign: The British are not 42 miles within Eritrea. The British troops advancing from Kassala are pressuring the Italians in the vicinity to fall back. The RAF is active, bombing various points throughout the region. Continuing the long-established pattern displayed by the Italians, they quickly give ground under determined attacks. At Keru Gorge, where they had established a fairly decent defensive position, the Italian 41st Colonial Brigade precipitously retreats during the night of 22/23 January under pressure from Indian 4th and 5th Divisions (primarily the Indian 10th Infantry Brigade). What they forget to do is tell their command, General Ugo Fongoli and his 800 headquarters troops nearby that they are leaving. The General and his troops become guests of His Majesty for the duration of the war. The Indian troops continue pressing forward toward Agordat, and the Italian retreat turns into a fleeing mass of panicked men. 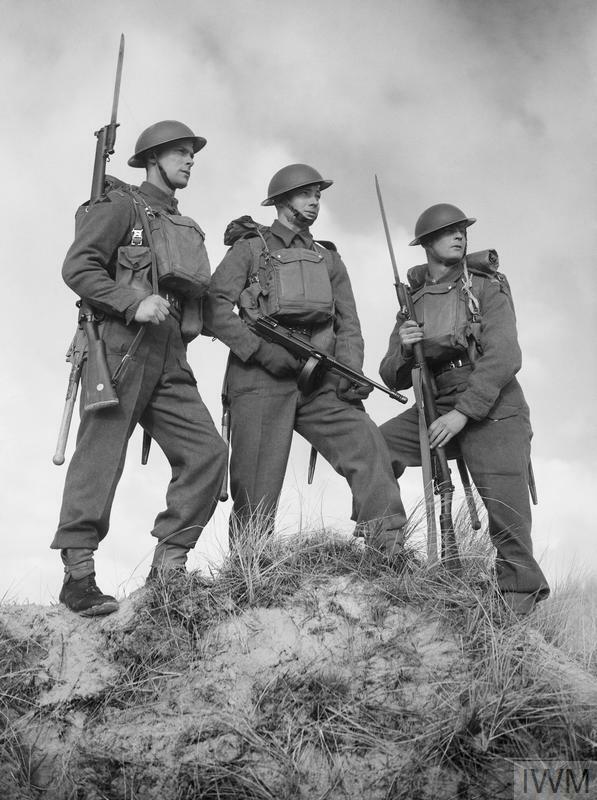 "Posed portrait of three guardsmen from 1st Battalion, Grenadier Guards, 23 January 1941." © IWM (H 6864). European Air Operations: The slow pace of operations continues. The Luftwaffe only drops scattered bombs along the east coast of England, and neither side puts bombers in the air after dark. Battle of the Atlantic: One of the little-known stories of World War II is the occasional breakout attempts of merchant ships from internment or capture. Ships from both sides have attempted it, with varying success. Today, five Norwegian ships (Elizabeth Bakke, John Bakke, Tai Shan, Taurus and Ranja) engage in Operation Rubble. Under the command of British temporary attache to Stockholm Captain R.D. Binney, they journey mostly as a convoy (one ship is faster and travels independently) from Gothenburg, Sweden through the Skagerrak north of Denmark and head for a rendezvous with the Royal Navy. It is a rare escape attempt within the Baltic by ships operating against German interests, as the Germans have complete hegemony over the western Baltic at this time. German heavy cruisers Scharnhorst and Gneisenau continue their journey north along the Norwegian coast as part of Operation Berlin. A British agent spots them between Denmark and the island of Zealand and reports to England. The British are preparing to send their heaviest naval units north to confront them before they can break out into the North Atlantic. The Luftwaffe (Focke-Wulf Fw 200 Condors of 1,/KG 40) bombs and sinks 3564 ton British freighter Lurigethan in the shipping lanes about 500 km west of Ireland and south of Iceland. There are 16 deaths and 35 survivors. Not far away from where the Lurigethan sinks, the Luftwaffe also bombs and sinks 4524 ton British freighter Langleegorse (entire crew lost) and 1859 ton British freighter Mostyn (two dead). The Lurigethan, incidentally, is abandoned by her surviving crew and left as a derelict and will be sunk on 26 January by U-105. Royal Navy 255 ton minesweeping trawler HMT Coutier hits a mine and is damaged, but makes it to Milford Haven. Royal Navy 248 ton minesweeping trawler HMT Ronso also hits a mine, but also makes port. The Kriegsmarine sends four minelayers to lay mines off the south coast of England during the night in Operation SW-b. Convoy FN 390 departs from Southend, Convoys FS 394 and FS 395 depart from Methil. In the Royal Canadian Navy, minesweeper HMCS Reo II and corvettes HMCS Agassiz and Bittersweet are commissioned. Minesweeper HMCS Wasaga is launched. U-204 and U-561 are launched. 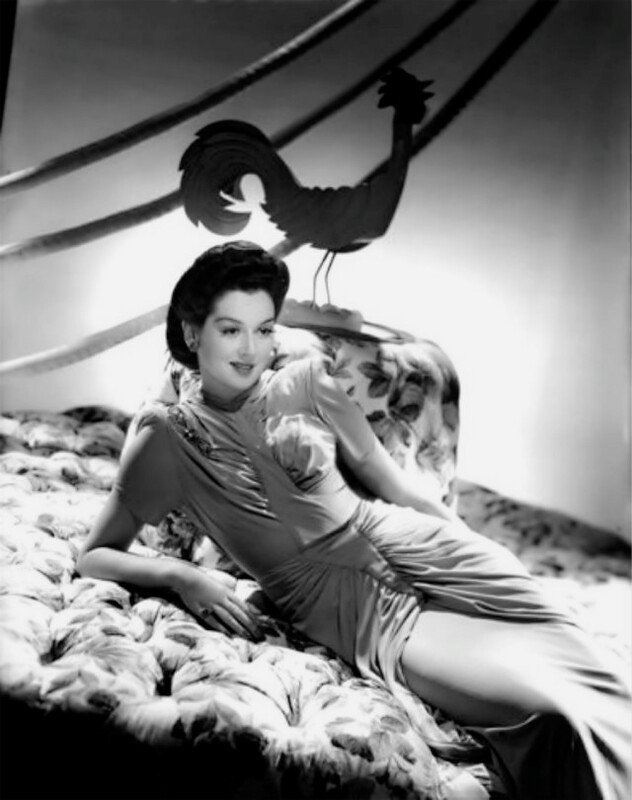 Rosalind Russell in a promotional shot taken on 23 January 1941, perhaps for her upcoming starring role in "They Met in Bombay" with Clark Gable. Battle of the Mediterranean: Emergency repairs are completed on HMS Illustrious, and, at 1846, it departs from Grand Harbour, Malta for Alexandria (and thence Norfolk, Virginia for permanent repairs). The departure is timed to minimize the chances of Axis reconnaissance observing the escape attempt, and other more subtle precautions also are taken, such as keeping escorting destroyers in harbour as long as possible. This is a major operation (Operation MBD 2) covered by the Mediterranean Fleet, including battleships HMS Barham and Valiant. The Luftwaffe quickly notices the operation and prepares an attack on the carrier and its escorts before they get out of range. This is important not only for the prospects of getting the aircraft carrier back in service (eventually), but it also removes the major catalyst behind Luftwaffe Fliegerkorps X's recent onslaught of air raids against Malta. Thus, while the Illustrious Blitz may or may not continue, the Illustrious itself is no longer in harm's way within range of the Stukas. The departure of Illustrious, while good news for the British tactically, also leaves a strategic gap in the Royal Navy's Mediterranean Fleet which will take time to fill. Winston Churchill is unhappy about the recent Luftwaffe successes in the Mediterranean. As is his wont, he meddles in Royal Navy decisions, suggesting that the navy replace its obsolete Fairey Fulmars with monoplanes such as the American-made Brewsters and Martlets. General O'Connor of XIII Corps, fresh off another victory over the Italians at Tobruk (where all remaining resistance has ended), quickly sends his British and Australian units northwest and north, respectively, to continue Operation Compass. Next stop along the coast is Derna, a town of 10,000 people, while Mechili also is coming within view of the 7th Armoured Division. 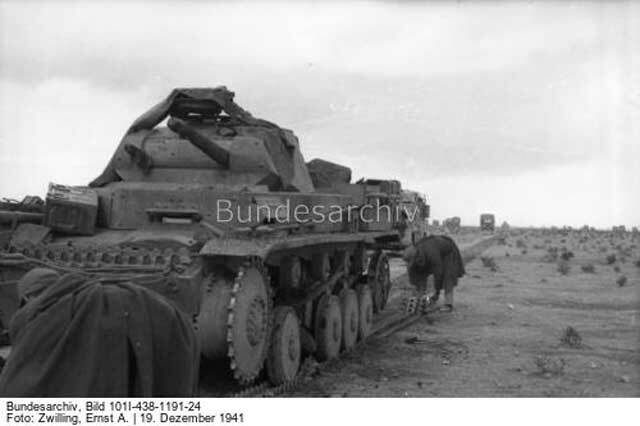 The Italians are sending Special Armoured Brigade (Brigata Corazzato Speciale) under the command of General Valentino Babini (also known as the "Babini Group") to block the coast road. Italian 10th Army commander General Giuseppe Tellera orders a counterattack against the advancing British Seventh Armoured Division for the 24th. The RAF bombs Derna. The British waste no time getting Tobruk Harbour back in operation as a depository of British supplies. They begin Operation Parallax, which aims to sweep the harbour of mines and restore the port facilities. Minesweeping trawlers HMT Arthur Cavanagh and Milford Counties begin sweeping the harbor today, while boom vessel HMS Magnet arrives to restore order in the port. In London, the Admiralty reports to the War Cabinet that recent RAF attacks on Fliegerkorps X bases at Catania, Sicily and elsewhere have been successful. However, the Luftwaffe is still in business and shortly will makes it continued vitality known. Battle of the Pacific: While the war by and large has not yet extended to the Pacific Ocean aside from scattered attacks by German raiders, the British in Hong Kong decide to make some preparations. They send minelayer HMS Man Yeung and destroyer HMS Thracian to seed some mines in the approaches to Hong Kong. US/Yugoslavian Relations: "Wild Bill" Donovan continues his fact-finding mission in the European and Mediterranean region. Today, he stops off at Belgrade, no doubt drawn by the issues in Romania that are attracting worldwide attention. US Military: Although a pre-World War I warship, battleship USS Arizona is made the flagship of Battleship Division 1 by Rear Admiral Isaac C. Kidd, replacing Rear Admiral Russell Wilson, who himself had relieved Rear Admiral Chester Nimitz. Charles Lindbergh testrifies before Congress, 23 January 1941. 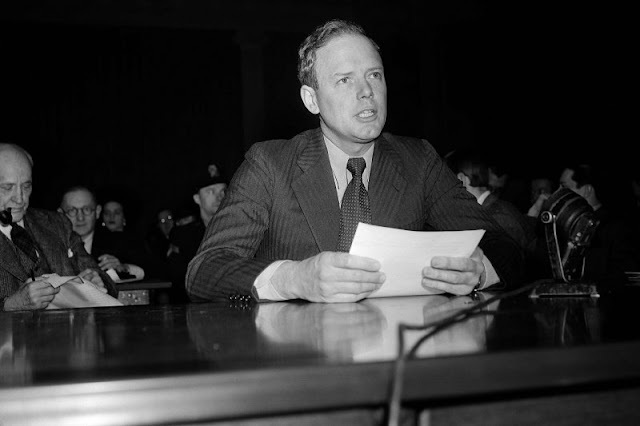 US Government: Aviation legend Charles Lindbergh is invited to testify before the House Foreign Affairs Committee. Lindbergh is a well-known Isolationist who is supported by, and supports, the America First Committee organized by a Yale student. Lindbergh knows many of the German leaders personally and has deep knowledge of the European aviation situation. Escorted into the chamber by police, he faces a largely hostile committee (most being Democrats behind President Roosevelt's support of Great Britain). He testifies that he is "in sympathy with the people on both sides" and prefers a negotiated peace. His theory appears to be that a complete victory over Germany would cause huge long-term problems in Europe, both economically and militarily. 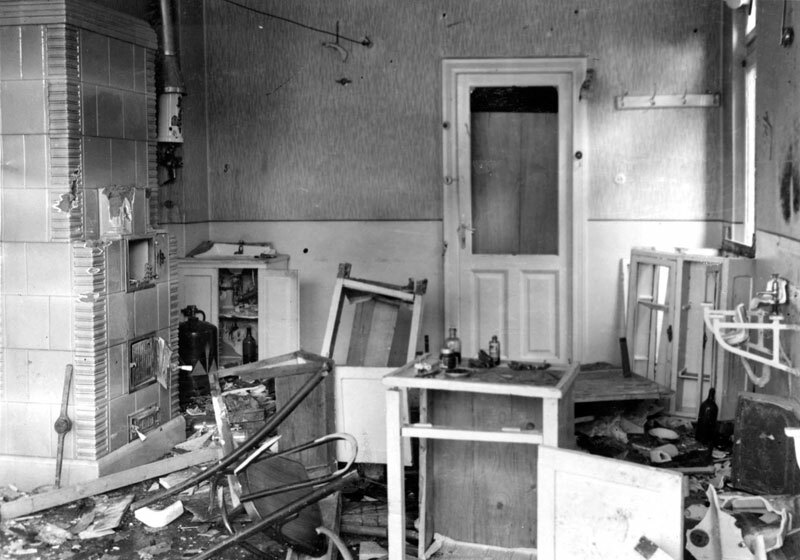 A destroyed doctor's office in Bucharest, Romania, 23 January 1941. Romania: Prime Minister Ion Antonescu calls in the troops, and the put down the Iron Guard rebellion that began on 21 January. His loyal army commanders assemble 100 tanks and other units from outlying areas and regain control of the Bucharest streets. General Ilie Şteflea's troops incur 30 deaths and 100 wounded, while sending about 200-800 Legionnaires to their eternal rewards. Contrary to international press reports, the Wehrmacht troops in Romania for other purposes never lift a rifle to quell or support the rebellion, but at Antonescu's request they afterwards stage a mock victory parade that ends in front of the Prime Minister's building. That gives Antonescu an air of legitimacy and support, but also creates an appearance of German control of the situation which is absolutely false. The politics of the situation now become extremely muddied. Antonescu is now cast in the role of a Romanian moderate, while the Iron Guard is shown to be perhaps the most extreme fascistic organization outside of Germany. Iron Guard leader Horia Sima, who disappeared during the rebellion, flees to Germany, while 9000 Legionnaires left behind are sentenced to prison. The facts of what happened in Romania never really filtered out to the western press during the war, and this episode contributes to the western belief that Hitler has "taken over" Romania. In fact, Wehrmacht units remain guests of the Romanian government who try as much as possible to stay out of the internal politics of the country. However, they are present, and the world just assumes they committed crimes. All that said, the true victims of the rebellion are the country's Jews. The Legionnaires burn down synagogues, destroy 1274 businesses of one form or another, and collect 200 trucks-worth of stolen items (along with vast sums of money, much of which likely gets buried in backyards and hidden in attics across the country). And even all that pales beside the torture, humiliation by the Iron Guard of at least 125 Bucharest Jews and undoubtedly others from other parts of the country as well. This, too, never really filters out to the international press, and the memory of all such depredations eventually get dumped in a single bin marked "Hitler." Indochina: The Japanese are getting tired of the rather pointless frontier war going on in French Indochina between Thailand and the Vichy French. While the two sides have expressed some interest in Japanese mediation, the war continues. The Japanese decide to hurry things along, so, in a classic example of gunboat diplomacy, they dispatch four cruisers from Kure for Saigon as an expression of their deep interest in a peaceful resolution. This is "S" Operation. Actress Rosalind Russell in a promotional shot taken on 23 January 1941.